Transfer your wedding party and guests to the Sydney Harbour islands or beaches by water taxi. Read on for wedding location ideas and our special group rates. From the moment you contact our water taxi team to the time you arrive at your special location, our personalised and expert service will ensure that we take care of the stress while you relax and enjoy your wedding day. Arrivals and departures that will never be forgotten! Forget wedding car hire, arrive in style by boat! 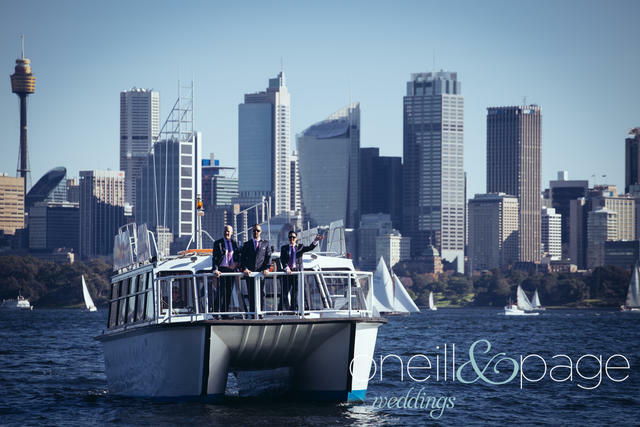 Take a moment to relax on the harbour before the big event as we transport you to your Sydney Harbour wedding venue. Your guests will be thrilled by the unforgettable experience and the beauty of travelling to your wedding by water. We can organise separate pick up points anywhere in the harbour that are convenient for your guests. Anywhere from Darling Harbour to Manly, Homebush or beyond. With our MAXI water taxi and experienced crew we can usher your wedding guests and wedding party to the big event. They will arrive together after the time of their life, a journey across Sydney Harbour. See our special packages for Sydney Harbour islands functions. Many of the harbour islands are suitable as wedding venues. Rodd Island is perfect for weddings. It is located in Iron Cove off Birkenhead Point near the Sydney suburb of Rozelle and has excellent facilities. Shark Island has a gazebo and beach and can be booked for private functions. There are facilities for guests such as picnic shelters, a large grassed area for the kids and did we mention that beach? Part of the Sydney Harbour National Park, Clark Island has pathways through natural bush and is dotted with quiet areas that are ideal for a private wedding ceremony. The island can be booked for private functions. Always a Sydney landmark, Cockatoo Island commands magnificent views of Sydney Harbour. The island boasts two cafes and a bar and your guests will be well looked after. Make you own history in this historical place. Why not have a Wedding with a difference - on one of the Harbour's spectacular Beaches! We are the only water taxi company who do beach landings. It is a unique and fun way to celebrate your special occasion. We can land you and pick you up from any of the beaches listed below. Just call 1300 420 829 to discuss your plans. Why not enjoy a cruise on the harbour on your special day? Whether you want to get some amazing photographs or enjoy some time on the harbour with your friends, we can make your day extra special. Call 1300 420 829 or email to enquire about our special Wedding packages.